RSS Feed for keyword: "Death Valley National Park Pictures"
Soaring temperatures and drought would have you think that there's nothing that could possibly survive in Death Valley National Park, which is part of the Mojave Desert. On the contrary, Death Valley plays host to some rare wildlife. After rare rain fall in Death Valley, wild flowers carpet the landscape, revitalized by the dowsing, while ancient lakes reappear then evaporate shortly afterwards. Mountains frame the valley, the Panamint Range and the Amargos Range, and these help maintain the climate of Death Valley National Park. For the tourist, sightseeing opportunities abound: Badwater Basin (the second lowest point in the western hemisphere), the Devil's Golf Course, the Race Track where rocks move mysteriously, Scotty's Castle, Artists Palette, abandoned mines and much more. The salt pans, plant life, roads and sand dunes are among the wide variety of Death Valley National Park pictures in this gallery. 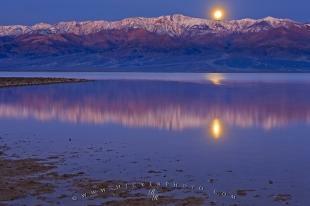 Interesting Photo galleries related to "Death Valley National Park Pictures"